Riding in the passenger’s seat, in a borrowed convertible, studying the way sunlight slipped through the leaves on late-summer trees– leaves that were just beginning to hint yellow. The lines from this poem tumbled forward in my mind, trying to express in small measure the glimpse of infinity given by that moment. The moment passed. And a few hours later, the memory still with me, I was boarding a plane to the Middle East, returning home after two weeks with friends and family on the U.S. East Coast. Landed in Rome, with a ten hour layover and an objective: to see the Sistine Chapel. On the way, though, I feasted my eyes on hall after hall of sculptures, tapestries, and paintings in the Vatican Museum, recognizing a few but most unfamiliar to me. The arrangement displayed the art of ages, showing certain pieces’ connections to the broader stories of Rome, the church, and art– some of them grievous and some great. 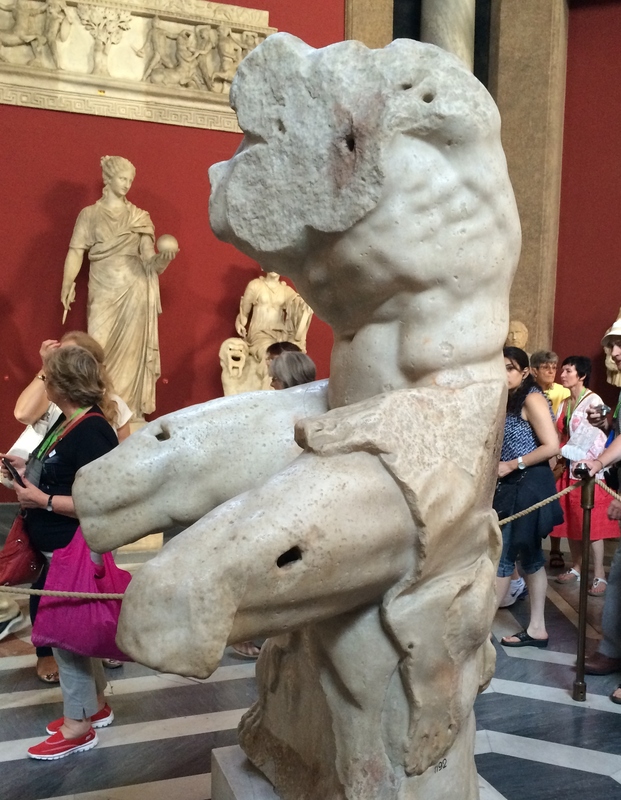 For example, the 2,000 year old Belvedere Torso. Perhaps the five-hundredth sculpture I had laid eyes on that day, but its story held me. Michelangelo, they say, took this sculpture into his studio. He sketched it from every angle for more than a year, and called it the greatest masterwork of sculpture known to humanity. Armless, legless and headless– for him, it was the source of inspiration from which he would create many of his own works, including dozens of the figures in the Sistine Chapel. When the reigning pope ordered him to complete the missing pieces of the sculpture, Michelangelo refused. “It is perfect,” he said. Friends gave counsel like Michelangelo’s stance on the Belvedere, as I prepared to return to the Middle East: Focus on what is present. Draw inspiration from it. Make something new, don’t replace what has already been let go. I feel sometimes like I’m missing appendages– like parts of me have been severed, leaving me awkward and off-balance. I am marred by what I don’t possess and trying desperately to replace, to be made whole, making the false assumption that the core cannot be completely beautiful if significant pieces are still missing. I was resolved to see with different eyes when I came back. I would focus on the beauty of the present, practice gratitude, smile, enjoy the good stuff and the hard stuff…. It lasted approximately one and a half days. I still miss my missing pieces. I still hope for being whole. I still long to see the restoration of peace here. On day two, I went to the university. “We would like you to teach American & British Poetry this semester,” they said. “Your class begins tomorrow.” So I began searching for the greatest works, the most beautiful poems of the English language. And I quickly found that these works connect with both the core and the missing pieces. Poetry gives expression to the things that are incommunicable through everyday language and structure. In our first class, we discussed Langston Hughes’ “Dreams.” A beautiful poem of perseverance, hope, and ambition, is it not? I rob my students of the depth of his work if I don’t tell them about the context– of the author as an African-American in the early-mid 1900’s, of the racism that exists today. My students receive the challenge to “hold fast to dreams,” not only when the sun shines, but also in the face of injustice. And as I return to life here, I can’t ignore the pieces that are broken, or backwardly attempt to recreate what has been. Instead, will I allow both the beauty and the brokenness inspire me, to be part of making something new?